It's easy to forget that without forests the human species probably wouldn't survive. We require oxygen and plants produce it. We produce carbon dioxide and plants absorb it. And most of that plant life is in woodland. During the twentieth century, thanks primarily to a dramatic increase in human use of oxygen to burn fossil fuels and a rapid reduction in the global acreage of woodland, the composition of air has been changing at an unprecedented rate, with carbon dioxide experiencing a sharp increase and oxygen a comparable decrease. It's a trajectory that will leave our descendants breathless. Photo taken in Japan by Britt Williams, 2008. To ignore forests is to ignore our own well-being. But how should we think about them? There are myriad ways to do so --as many ways as there are forest creatures. An aesthete, of course, might focus on how images of woodland have inspired artists, writers, musicians, or others in different places and times. But while such an inquiry could be delightful, it doesn't really constitute a study of human-forest relations because in and of itself it examines no noteworthy interaction. To understand forests and the forest-human relationship requires us to think in biological terms --how do all those plants, animals, and microorganisms live and interact, and why do the arrangements not only differ from place to place but also change as time passes. Such biological inquiries are of two types. One is the synecological study, which focuses on the forest as a whole. It examines "holistically" the patterns of interaction among its creatures and their context so as to understand how the woodland functions as an organic entity. The other is the autecological study, which focuses "particularistically" on the relationship between a specific type of creature and its ambient woodland. One can employ this latter autecological approach in the study of human-forest relations, examining the diverse ways humans have utilized woodland and the consequences of that use for either or both parties. A student of human-forest interactions might explore select aspects of the relationship, such as how particular types of use affect woodland (and/or its users) over time --e.g., clear cutting vs. selective cutting; logging vs. firewood collecting; strip mining vs. pit mining; monoculture replanting vs. natural reseeding, etc. Or one might focus on what appear to be particularly noteworthy "moments" of human-forest interaction to examine what happened, why, and the consequences thereof. Any of these approaches could be used in examining Japan's forests. Here we shall use the last one, the study of "moments." After briefly noting the early millennia of human-forest relations, we shall focus on four periods of intensive forest exploitation --those of the Nara-Heian monument builders, ca. 700-900 CE, the early Tokugawa monument builders, ca 1570-1670 CE, the Meiji industrializers, ca. 1870-1910, and the Greater East Asian War wagers, ca. 1937-1950. The observant reader may note that each successive "moment" is shorter and less distant from the preceding one. That trajectory is instructive, is it not? For thousands of years foragers ("hunter-gatherers") relied on Japan's forests for food, fuel, fabric, and the simple construction materials of their huts and hand tools. Their cooking fires occasionally ran out of control, and they may have used fire to clear areas for settlement or other use. But essentially Japan's woodlands remained unchanged despite the many millennia of forager activity. Then about 2,500 years ago (ca. 500 BCE), the cultivation of wet-rice (paddy) was introduced from the continent to southwest Japan. Over the next few hundred years paddy tillage spread eastward as far as central Japan --and later into the northeast as far as existing varieties of rice could tolerate the colder weather. Other dry-field and garden crops were also introduced from the continent, cumulatively resulting in Japan's transformation from a forager society into an agricultural society. During those thousand years or so of agriculture's spread across central Japan, its use led to the permanent clearing of most of Japan's alluvial lowlands and, gradually, of those lower portions of hillside that could be graded to form flooded fields or used for dry-field or "slash-and-burn" cropping, or as pasturage for horses and oxen. By 600 CE the process had transformed perhaps 10~15% of Japan's natural landscape --vast reaches of swampland and nearby lowland, which had previously supported diverse vegetation and other biota -- into tilled land that sustained only monoculture cropping and its associated "weeds" and "pests" -- meaning plants, animals, and micro-organisms unwanted by the tillers. The establishment of agriculture thus altered southern Japan's overall species composition and probably resulted in some unrecorded extinctions of one sort or another. Besides clearing vast acreages of lowland, these agricultural people consumed ever more wood. In part this trend simply reflected the unprecedented population growth of those centuries --from perhaps 100,000 in 500 BCE to upwards of 5,000,000 by 600 CE. But in part it resulted from an expanded demand for fuel wood that came with the introduction of iron and bronze metallurgy. And in part it sprang from heightened social stratification and complexity, which was made possible by agriculture's greater productivity per capita. Those gains enabled some, by exploiting the labor of others, to enjoy more elaborate residences, ceremonial structures, boats, fortifications, weapons, warehouses, tombs, and other items. Nevertheless, even in southern Japan --which contains some of the archipelago's geologically oldest, least precipitous, and therefore most accessible terrain --this era of gradually expanding land clearance seems to have left most woodland intact. During the 600s-800s CE, Japan's ruling elite consolidated its control over the archipelago as far north as the Sendai vicinity. The rulers encouraged land clearance and paddy tillage as a source of regular tribute (taxation) to support the aristocracy that assembled around their headquarters in the Kinai Basis. In line with their political pretensions, they adopted grand continental styles of architecture for both secular (mainly palace and mansion) and religious (mainly temple and shrine) construction. And they did so with aplomb, producing glorious monumental structures for their successive capital cities, notably Nara (ca. 710 CE ff) and Heian (ca. 795 CE ff), which came to house an estimated 100,000-200,00 residents, nearly all of them non-aristocrats. Most of the era's urban growth and construction occurred in the Kinai Basin, and most of the resources for it came from that locale. There is ample evidence that the combination of logging, fuelwood collection, and conversion of land to arable produced major changes in Kinai woodland. Lowland was all cleared; on hilly areas, rich conifer climax stands were felled, giving way to scrub brush and mixed broadleaf growth. Because of the sustained demand for firewood, those logged hillsides were unable thereafter to evolve into mature conifer stands. Instead, much survived as highly flammable brushland, and by the 700s forest fires were becoming a menace to settled areas. Having created the huge urban demand for wood, rulers found their attempts to restrict forest exploitation largely ineffective. And the few efforts to encourage reforestation seem to have achieved little. 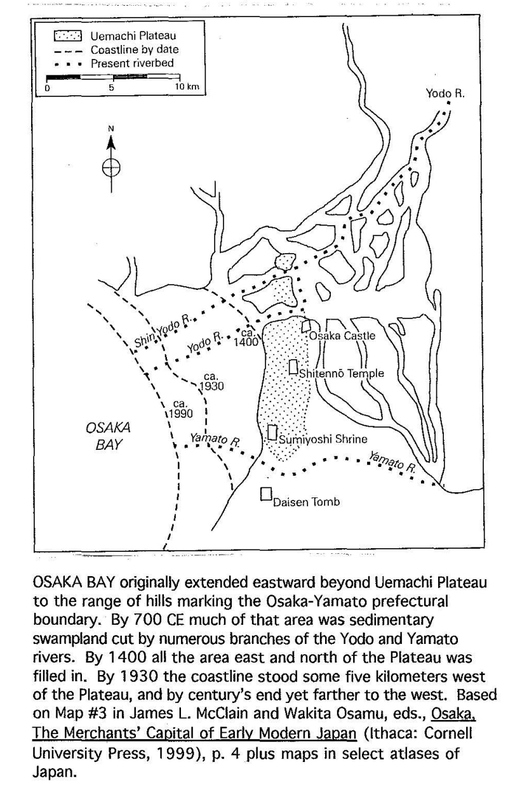 The destruction of ground cover by woodcutting, scavenging, and wildfire intensified runoff and soil erosion, and as a result the great bay at the mouths of the Yodo and Yamato rivers gradually filled in, creating the site of today's city of Osaka. In Nara-Heian Japan, as in all pre-industrial societies, the single greatest human demand on forest was for fuelwood --for cooking, heating, and such manufacturing tasks as pottery-and tile-baking, metal-casting, and salt-making. The unintended conversion of conifer forest to permanent hardwood growth helped meet that demand for fuel, but scarcities still led to conflicts among users and a gradual shift of some manufacturing activities to other localities. The loss of accessible timber for grand construction may have had the greater political impact, however, because it hurt the ruling elite more directly and visibly. By the tenth century, the scarcity of timber was bringing an end to monumental construction. It also was leading to the use of inferior materials and to more modest styles of building. One strongly suspects that this overuse of woodland was a significant factor in the longterm decline of Heian city's size and population and in the wealth, power, and political stature of the elite who resided there. During the Nara-Heian centuries, Japan's population grew slowly, despite periodic, lethal epidemics of smallpox and measles. From about the 1200s onward, those epidemics appear to have become less virulent, and population growth accelerated, giving the realm some 15,000,000 people by ca. 1600 CE. Concurrently, a gradual weakening of the central polity spurred intensifying regional conflict and, finally, forceful reconsolidation, mainly during the later 1500s. The renewal of population growth was made possible by agronomic developments. Most important were the widespread adoption of fertilizing with mulch to sustain soil fertility, more elaborate techniques of paddy irrigation, and more widespread use of draft animals, plows, and other iron tools. In addition, there was more extensive cultivation of hillsides, more pasturage, and more "slash-and-burn" tillage on steeper sites. In diverse ways these measures all placed greater demand on woodland. Across central Japan from the vicinity of Kamakura westward to the Inland Sea littoral, most lower hillsides were converted to grass, scrub-brush, and hardwood coppice growth, and some patches eroded, deteriorating into barren land. However, because so much of Japan is steep mountainside, much terrain remained inaccessible to woodcutters, and on balance it appears that for the realm as a whole, most woodland retained its basic vitality and biodiversity well into the sixteenth century, when Japan entered a new phase of consolidated control by a ruling elite. During the later 1500s, major warlords (daimyo or "great names") fought for hegemony in Japan, and in the year 1600 the Tokugawa faction emerged supreme, establishing a new era of firm, stable rule for the entire realm. These warlords, including the Tokugawa, vigorously promoted agricultural production, urban growth, and monumental construction. In essence this new surge of city-building and celebratory construction constituted the Nara-Heian surge writ large. Whereas the earlier one wreaked havoc on the Kinai basin; this later one did so on accessible woodland all across Japan south of Hokkaido. That difference in scale reflected several differences in the two situations. First, as noted above, Japan's human population had grown substantially, and that growth accelerated after 1600, giving the realm some 30 million people by 1700. The acceleration was accompanied by intensification of the agricultural trends noted above, which reduced woodland acreage even as it increased the demand for fertilizer material, fuel wood, and other items. Moreover, whereas the ruling elite of Nara-Heian had concentrated its urban growth and monumental construction in the Kinai Basin, the early Tokugawa elite was much, much larger and scattered widely across the realm, mostly in the castle towns of the 280-odd daimyo. So the urban demand for fuel wood and construction material became widespread and intense as grand castles and mansions, temples and shrines, ships, wharves, warehouses, and diverse other structures were erected across the realm. The scale and diversity of construction projects meant that a much greater variety of wood could be used, enabling loggers to engage in more complete clear-cuttling of the areas they harvested. The felling was much faster thanks to the development of high-tempered crosscut saws. And logging operations could extend much farther into Japan's mountainous interior thanks to the utilization of more elaborate mechanisms of timber transport, which included "winces, sledges, chutes, trestles, river booms, and storage areas" as well as rafts, ships, and pack horses.1 These logging projects could be large and elaborately organized by the daimyo and their commercial representatives, who were able to ship their yield widely about the country in response to demand. This countrywide logging was pursued with such resolve that by the 1650s, timber supplies were growing scarce. In addition, the consequences of overcutting -- wildfire, erosion, landslides, flooding, and downstream destruction -- were becoming too serious to be ignored. As a result monumental construction again petered out, urban growth stalled in most places, conflicts among woodland users escalated, and efforts to control the damage began to appear. It thus seemed that the Tokugawa ruling elite had simply replicated the Nara-Heian experience in spades. But as matters worked out subsequently, the regime proved sufficiently well organized and attuned to developments so that it could initiate effective systems of forest management. It could do so in great part because villagers, too, were well enough organized so that they could develop and enforce their own local land-use arrangements to reduce woodland damage while accommodating the larger-scale restrictions imposed by rulers. By 1700, the general shape of this system of regulated woodland-use had taken shape. And during the following 150 years it was supplemented by the development of extensive reforestation programs that utilized seedbeds, seedlings, cuttings, and detailed programs of aftercare and managed harvest to rebuild timber forests and help control erosion and downstream damage. As of 1850, it appeared that the people of Japan had devised a purposeful system of long-term sustainable forest usage that was actually succeeding. As matters worked out, those people never had a chance to see if their Tokugawa-era forest system could achieve long-term sustainability. During the 1850s-60s the major imperialist powers forced Japan's leadership to accommodate their mercantile wishes, and that development set in motion harsh domestic conflicts that culminated in overthrow of the Tokugawa and establishment of a new regime in 1868. The victors centered it in Tokyo, the re-named headquarters of the former Tokugawa regime. By 1872 leaders of that new Meiji government had concluded that their best defense against the imperialist powers was a good offense --to master the military-industrial arts of Euro-America and implement them in Japan. Although they surely could not have grasped the magnitude of the change on which they were embarking, they were in fact undertaking to transform an agricultural society into an industrial one. Embodied in the slogan fukoku kyohei ("rich country, strong army"), that policy had several dimensions: elaboration of a strongly centralized government anchored in a well-organized tax base; creation of an up-to-date, steam-powered navy and large, national army; development of the requisite mining and manufacturing facilities; establishment of railroad and telegraph systems, and appropriate training of the general populace to function in this new world. In two basic ways that overall program had a massive impact on Japan's woodland. Most obviously, it called for a vast increase in the use of both timber --for ships, buildings, other urban structures, vehicles, railroad ties, telegraph poles, and mine timbers -- and fuel wood -- especially for steam power and industrial smelting. That demand for fuel was also increased by a new surge in population growth, which gave Japan about 50,000,000 people by 1910. Much less obviously, the program entailed a radical and deeply disruptive rearrangement of the human-land relationship. The Tokugawa order had perpetuated and elaborated the established concept of "use rights," in which the "benevolent" Confucian ruler assured households, villages, and local leaders of their right to use land, whether arable or woodland, in return for payment of tribute. During the Tokugawa era that system came to embody --especially on woodland, with its diverse uses --an immensely complex and variegated system of household, communal, and rental uses, restrictions, and obligations. In one way or another, villagers throughout the realm had a powerful vested interest in local particulars of the system, especially as those related to woodland. During the 1870s Meiji leaders undertook to replace the whole, complicated system of use-rights with the alien one-size-fits-all notion of "land ownership." That project had two basic goals. One was to establish a clear basis for assessing "property taxes" on all owners of "private property." The other was to establish clear, uniform government control -via ownership and direct management -- of all the woodlands that daimyo and the Tokugawa regime had once claimed as "lord's forest," an acreage encompassing roughly half of Japan's woodland and all of the best timber stands. Because woodland use-rights were so intertwined, with villagers even enjoying select rights on much lord's forest, the reform policy produced a countrywide firestorm of resistance that gradually forced the Tokyo regime to devise an array of face-saving compromise formulations. But most villagers realized that their old rights were in fact no longer secure. In essence they sensed that theirs was a "use it or lose it" situation. And fortunately for them, in terms of woodland harvest, the rapidly growing demand for timber and fuel wood made it an opportune time to cut down trees and sell the wood before the land-tax reformers could prevent that from happening. As a result of this confluence of increased demand for wood and compelling reason to harvest now rather than later, forests were rapidly felled throughout Japan during the 1870s-90s. The rapidity was enhanced by widespread re-adoption of crosscut saws (which had been prohibited for most of the Tokugawa period) , a big expansion in lumber-merchant operations, their use of steam-powered sawmills, and the development of railroads and expanded shipping facilities. Predictably this assault on woodland gave rise to widespread erosion, flooding, and downstream damage. In well-wooded, mountainous Yamanashi Prefecture in central Japan, for example, an official report of 1901 summed up the woodland situation this way.2 In paraphrase, the report "warned that ever since the restoration, Yamanashi forests had been abused." So fuelwood and lumber have become insufficient; flooding and erosion are ruining terrain and people's productivity; the costs of riparian repair are escalating, and year after year the regional economy deteriorates. As for the future, if the forests are not repaired, flooding will worsen and the prefecture's people will be devastated. In an assessment of costs, the report detailed the ways in which the forest problem was damaging Yamanashi: in lost income; in losses of irrigation water and fertilizer materials; in deaths, injuries, and bereavement; in the costs of enforcing forest law and prosecuting violaters; and, finally, in the cost of repairing and replacing river banks and dikes, ruined roads and bridges, and wrecked fields and irrigation systems. ...[Finally,] in a despairing conclusion they declared that they did not know how to cope with the situation. Tokugawa success, it appeared, had given way to Meiji calamity. As the evidence of public resistance and woodland damage had mounted, however, government officialdom had felt compelled to devise more and more policy compromises. By century's end the growing recognition of overcutting's consequences, together with Tokyo's mix of compromise and insistence, was producing a reasonably stable, simplified, and standardized system of woodland management that encompassed Japan, even to include Hokkaido, with its vast reaches of old-growth forest. The system gave government substantial control of most timber-producing woodland while villagers retained control of most of the lower hillsides, which produced mulch, fuelwood, and small-size timber. During the early twentieth century the government pursued vigorous policies designed to revitalize woodland, both as a means of controlling downstream damage and as a way to restock harvested woodland so that it could produce the needed timber and fuelwood for Japan's future. By the 1910s these policies were being widely implemented, and by the1920s-30s the efforts of government foresters, cooperating villagers, and entrepreneurial forest owners showed striking progress in terms of both better flood control and an expanding volume of standing timber. Once again, it appeared, Japanese society had devised means to sustain the vitality of its woodland, this time in the service of a rapidly growing industrial society. The successes of late-Meiji reforestation notwithstanding, during the 1930s-40s Japan's woodland-recovery efforts came to nought for the second time in a century. And, again, they were undone by foreign complications, which eventuated in the greatest assault on woodland in Japan's entire history. Whereas the disruption of Tokugawa forest recovery resulted from initiatives by foreigners, however, during the later 1930s it was initiatives by Japan's leaders that wrecked the late-Meiji recovery. In 1937, a minor incident between Chinese and Japanese military forces near Beijing spun out of control, escalating into a full-scale Japanese attempt to defeat the Chinese government militarily. Early triumphs gave way to near stalemate and a grinding war of attrition. The war effort created civilian labor shortages that halted ongoing programs of woodland maintenance and repair even as it sharply raised the demand for timber -for use in warships, airplanes, military trucks and other vehicles, gunstocks, buildings, shipping crates, and so on. And as the fuel demands of warfare created scarcities of fossil fuel, more and more firewood and charcoal were needed for myriad domestic purposes. Throughout Japan and its colonies (notably Karafuto, Korea, Manchuria, and Taiwan) wood-cutting intensified. Then in late 1941, in a desperate bid to obtain more fuel supplies and break the impasse in China, Japan's leaders tried to open their way to southeast Asia and its rich resources by crippling the U.S. Pacific fleet. The plan backfired; warfare expanded, and the demand for forest products escalated. Forest regulations were suspended; maximum harvest was pursued, and by war's end in late 1945, accessible forests throughout the empire had been stripped of usable timber and scavenged for fuel wood. Even trees in city parks had been cut down and consumed. By then most of Japan's cities had been incinerated by American fire-bombing, and the country, newly deprived of its colonial lands, faced the unprecedented task of constructing millions of houses and other buildings and facilities from what remained of domestic woodland. Further complicating the situation, as in the 1870s, a postwar program of "land reform" threatened many woodland owners with loss of forest and thereby spurred another period of "use it or lose it" entrepreneurial logging. And again, the intense demand for lumber made such harvesting advantageous. New technology, too, spurred the felling, as loggers on government woodland used chain saws, high lines, and other mechanical devices to reach timber that previously had been inaccessible and to extract it faster than ever. Despite this intensive logging, however, demand far exceeded the domestic supply. So plywood, pulpwood, and other wood products were imported, and concrete was used widely in place of wood construction. 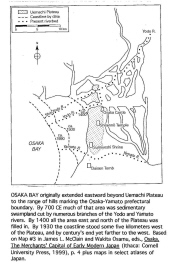 However, neither imports nor substitute materials saved the woodland from further over-cutting, and by the early 1950s the problems of erosion, flooding, and downstream damage were extensive, seeming to repeat the experience of Japan's earlier "moments" of rampant overcutting. Even as reforestation continued into the late 1950s, however, demand for wood products began dropping across the board. Especially during the 1960s, fossil fuel imports rapidly replaced fuel wood; commercial fertilizer replaced mulch; gasoline-powered machinery replaced fodder-eating draft animals; ferro-concrete, metal, glass, and plastic met many other needs. And finally, from about 1970 onward, imported timber became less expensive than that produced at home, causing imports to surge and the domestic harvest to decline rapidly. In consequence of these developments, nation-wide demand for homegrown wood and other forest products of every sort dropped sharply, llnd all over the archipelago woodland grew luxuriantly green. Escalating air pollution and expanding recreational use of woodland continued making inroads on biodiversity and threatened some species, but once again it appeared that basically a "moment" of forest devastation had been survived and Japan's woodland restored, ready again to meet future needs. So, how would one summarize Japan's forest experience? One could observe, first, that Japan's ancient forager society co-existed with its woodland home for tens of thousands of years, leaving it little altered. With the adoption of agriculture, however, things began to change. Within a millennium or so, woodland in the socio-economic heart of the realm (the Kinai Basin) was being devastated by over-use, and less than a millenium later, around 1600 CE, that assault was extended to the entire country. The downstream consequences of this latter assault, however, elicited responses that seemed eventually to be remedying the problem. The Meiji adoption of industrial technology and ideals from the 1870s onward undid those remedial measures, and within a century industrial society twice devastated the archipelago's forest realm. On both occasions the damage elicited vigorous remedial measures that served for a time to reverse the damage. The escalating demands of industrial society were such, however, that in both cases, part of the remedy was to shift the logging enterprise and its destructive excesses abroad, to the colonies during the Meiji period and via "free trade" to other areas (mainly the Americas and Southeast Asia) after the 1960s. 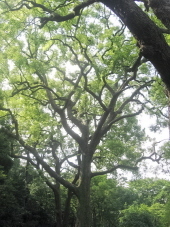 In sum, then, it appears that while Japan's forager society always retained open-ended possibilities and agricultural society did eventually devise ways to live within the limits of the archipelago's forest resources, industrial society has made do with temporary "fixes" that depended on shifting the damage elsewhere. The first "fix" ended in 1945; how long the second version of that strategy will endure remains to be seen. 1 Totman, The Lumber Industry in Early Modern Japan (Honolulu: UHP, 1995), p. 49. 2 Totman's paraphrase of the report, in Japan's Imperial Forest: Goryorin, 1889-1946. (Folkstone, Kent: Global Oriental Ltd., 2007), pp. 51-52. 3 Totman, A History of Japan (Oxford: Blackwell Publishers, 2OO5), pp. 512-513.